Coast-to-Coast Magazine puts our photo on the cover!! Coast-to-Coast Magazine is featuring our photo on the cover of their Summer 2013 issue!! Inside the magazine is our six page story about the many stunning hidden gems in Utah that lie between the more famous National Parks. This pic was taken at Red Canyon State Park, perhaps the most magnificent of these too-often-overlooked destinations. We climbed high up on one of the hiking trails and watched the endless stream of RVs parading by on the highway below us: Rental Class C RVs, truck campers, travel trailers, Class A motorhomes, fifth wheels, and popup tent trailers dominated the roads in the area, many driven by foreign visitors to America’s crown jewels. Lots of folks go to Utah to see Bryce Canyon and Zion National Parks, and they often hit the spectacular North Rim of the Grand Canyon while they are in the neighborhood. However, Cedar Breaks National Park and Red Canyon State Park are equally majestic, and the lava tube caves (Mammoth and the Ice Cave) and waterfall hike at Cascade Falls are sure to inspire. While in the area, we visited Best Friends Animal Sanctuary, an impressive and extraordinary multi-acre no-kill animal sanctuary that is set in a beautiful red rock canyon and caters to all of God’s creatures from bunnies to horses. Southern Utah is absolutely ripe with possibilities for fun summertime RV travel, and I’m sure we will return many times in the future. Even though Elkhart Indiana is the official heart of the RV industry with its RV/Motorhome Hall of Fame set smack in the middle of The RV manufacturing industry and Amish Country, I would claim that this southern portion of Utah is the heart of RV travel from June to August!! 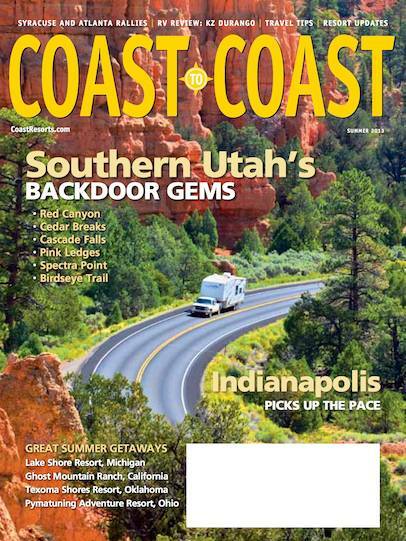 Coast to Coast Magazine is the membership magazine for Coast-to-Coast Resorts, a family of resort RV Parks that is very popular among long-term and full-time RVers. Unfortunately, the magazine does not appear on newsstands, but if you join or if you know a member, you can get a peak at our story in this season’s issue! See all our announcements and Our most recent posts!